Maestro by Gibson full size, steel string acoustic guitar with accessories. 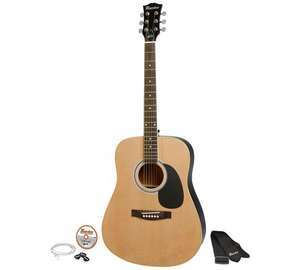 This guitar is based on the classic dreadnought design and has a spruce top which give it a big, clear sound. The pack is ideally suited for a beginner or novice player with strap, picks and spare strings all included. The pack also contains easy-to-follow lessons on an instructional DVD. The guitar has beautiful black gloss body and natural top finished with white binding and chrome die-cast tuners. Easy to play 24 " scale length, on a comfortable, fast neck profile. Designed with the beginner in mind by gibson. Review here. Advice seems to be that changing the strings will improve the sound a lot. I think at £60 it is an okay deal - it is a Chinese guitar with a branded name on it and will be not much different from all the other own brands you get in Dawsons etc at a similar price point. I think the Yamaha F310 at around £100 is probably a better long term guitar, but it is obviously 40 quid more. I don't think this is a great deal. The guitar doesn't sound great even for the price, and I'm wary of anything that comes with a 'starter pack' anyway. The DVD is pointless with all the information online these days, the plectrums are probably crap anyway, the strap is pointless for a beginner because you should be sitting down to learn. Spare strings will most likely be crap as well. Save up a little bit more and get a proper guitar to learn with. I appreciate you'll have to spend as much again to get a guitar plus strap and case but honestly, there is nothing more important than your first guitar being nice to play, especially an acoustic one. Not even whether it sounds particularly good. If it's not enjoyable or difficult, you'll be miserable and have wasted all £60. There are very good guitars for not much more than £100 which will last more or less as long as you want them to. Go second-hand if that's too much, you're never short of choice. Subtley find out where it's been kept, because if the temperature has been fluctuating a lot you'll have a time keeping it in tune. Often on offer from amazon sub £100. Ordered. Thanks for posting. Heat from me. Yamaha is much better in this price range. Voted hot because it's a good price but I'd still advise anyone wanting to learn guitar to pay slightly more for a better instrument. Like others have said, the Yamaha F310 is a great tried and tested method and is a very reliable choice for a first guitar at ~£100. I'd get a second hand that's easier to play. These tend to have a relatively high bridge if I'm thinking of the right one and it's hard to physically press the stings onto the frets for a beginner. If you want to turn off someone new to playing guitar, buy this. The main thing about Yamaha that is impressive is the action. These cheap Made in China Fenders and Gibson have so high action that they are pretty much unplayable and they will be a bad experience for a new guitarist. Barre chords? Forget it, unless you pay another 50 quid on a good setup.